At the present time, consumers in the market for the best hybrid trucks only have a choice of two – both from parent automaker General Motors. These two hybrid trucks are the 2011 Chevrolet Silverado 1500 Hybrid and the 2011 GMC Sierra 1500 Hybrid. While the choice may seem limited, with the amount of capability, along with the comfort and fuel efficiency of these two products, consumers can feel good about going green. Silverado 1500 Hybrid, you get fuel efficiency that no other full-size competitor truck (except for the GMC Sierra 1500 Hybrid) can offer – an EPA-estimated 20 mpg city/23 mpg highway. America’s first two-mode hybrid full-size pickup delivers up to 25 percent better city fuel economy than Toyota Tundra and Ford F-150 and up to 30 percent better than Dodge Ram. The hybrid features two modes. Mode 1: At low speeds and light loads, Silverado Hybrid operates on electric power, engine power, or any combination of the two. Mode 2: Use this mode primarily at highway speeds or when driving conditions require, such as towing trailers or climbing steep grades. Mode 2 provides an electric assist in addition to four-cylinder or full eight-cylinder power. Plus, you get the kind of capabilities the full-size Chevy pickup is known for: Vortec 6.0-liter V8 engine, 332 horsepower, 367 pound-feet of torque, up to 6100 pounds of towing capacity (two-wheel drive), and up to 1553 pounds of payload capacity (two-wheel drive). Available in two-wheel drive and four-wheel drive, the 2011 Chevrolet Silverado 1500 Hybrid comes with a crew cab is loaded with technology and safety features. Starting manufacturer’s suggested retail prices range from $38,340 to $47,820. 2011 GMC Sierra 1500 Hybrid – In many respects, the 2011 GMC Sierra 1500 Hybrid is similar to its Chevrolet sibling – albeit a bit more upscale in price. 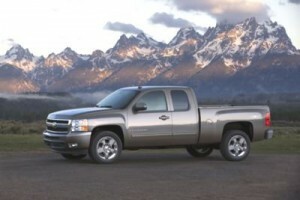 Starting MSRPs for the 2011 GMC Sierra 1500 Hybrid range from $38,710 to $48,190. While there’s not really a major price difference between the two, aficionados of either brand will claim their choice is the better value. If you need a truck, do mostly city driving, and want to go green, the GMC Sierra 1500 Hybrid may be an excellent choice. With the same two-mode hybrid technology and 332-horsepower 6.0-liter V8 engine as the Chevy Silverado 1500 Hybrid, the 2011 GMC Sierra 1500 Hybrid offers best-in-class V8 fuel economy – providing 40 percent improvement in city fuel economy compared to non-hybrid models. The crew cab configuration, leather-wrapped steering wheel, Bluetooth, available leather seating and navigation, among many standard and optional features, set the 2011 GMC Sierra 1500 Hybrid above run-of-the-mill pickup trucks. Bottom line: If you want and need a full-size pickup and prefer a hybrid, you won’t find it at Toyota or Honda or Dodge or Nissan. The best hybrid trucks are from Chevrolet and GMC.